After recent reports of a meeting between MK Hanin Zoabi and a Hamas official it is now revealed that two United Arab List-Ta'al MKs had met with the figure earlier. 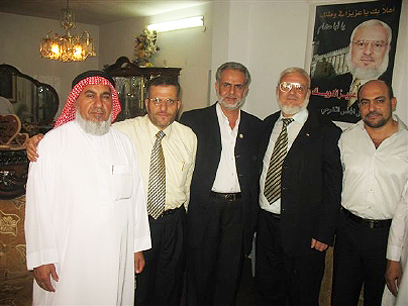 Masud Ganaim and Ibrahim Sarsur visited the home of Hamas parliamentary speaker Aziz Dwaik, 64, to offer their support after he was released from an Israeli prison in June 2009. Dwaik was arrested again on Thursday. The Hamas man was first arrested in August 2006 by IDF forces in Ramallah as part of a series of arrests in the wake of the abduction of Gilad Shalit. 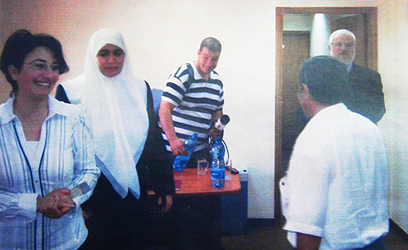 A geography professor, Dwaik was convicted of membership in a terrorist organization in 2008. He was sentenced to three years in prison, two years of probation and was ordered to pay a NIS 5,000 fine (roughly $1,318). After his release, and several days prior to Zoabi's visit, the Hamas leader met with Ganaim and Sarsur as well as former Rahat council head and senior official in the Islamic Movement's northern branch Jumaa Qsasi. The MKs are claiming the meeting was legitimate as the people concerned were "political figures fighting against the occupation." MK Ganaim said, "We visited the house together with several other members of the Palestinian council. Hamas was legally and legitimately elected in what the whole world admitted were just elections and we went to visit the officials after they were released from jail." Referring to claims they were in contact with figures who were jailed for aiding terror, Ganaim said: "As political figures they should never have been arrested. Our arrival there was not in violation of the law. I, as a Knesset member or a private person, am allowed to visit a person who was wrongly arrested. It has never been proven they were involved in the alleged activity. They have a right as occupied individuals to fight for life in dignity." Likud MK and chairman of the Knesset house committee Yariv Levin said in response: "The Arab MKs are competing who is the greatest traitor and terrorist sponsor while using the weakness of the legal system. The Attorney General must take a firm hand and put an end to the parade of MKs spitting in the State's face and protect Israel and the Knesset from the terror sponsors amongst us." Ganahim retorted, "MKs make protest everything. They protest us being Arab and our very presence in the Knesset. We shall stay there whether they like it or not. If Israel honors a different world view it should not be dragged by some rightist extremists who seek press at the expense of the Arab MKs. If we broke the law with our visit let them charge us." Ganaim noted that the issues discussed during the meeting mainly concerned the Palestinian council and the rift between Fatah and Hamas. "We didn't discuss specific issues. We are no Hamas members but it was a visit meant to support their struggle against the occupation." MK Sarsur added, "It was not the first time we visited Dwaik. I personally visited him twice during his incarceration. He was ill at the time and I went to see how he was. He's a good friend of mine, from the time before he was elected to the Palestinian council." He described the accusations against Dwaik as terror sponsor as false. "All those who Israel held hostage were arrested because of Shalit's abduction. They were victims of the Netanyahu government's policy. "Israel treats the Palestinian people as the enemy. They treat Abu Mazen (Palestinian President Mahmoud Abbas) and Fatah leaders in the same manner. The problem isn’t the Palestinian people. Dwaik is a political person, not a terror facilitator." See all talkbacks "More Arab MKs met with Hamas official "